Many thanks Ronnen for all your work, professionalism, creativity and patience with this website design project. You and your team have been amazing. I would be more than happy to recommend your web design company to future customers and potential employers. 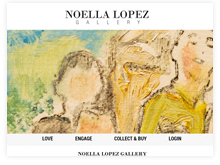 The website design looks great and I hope that many art lovers will love it too and buy many artworks.